When the icy and bloody grip of winter has come and gone, the Game of Thrones actors have proven to be pop culture vultures. Maisie Williams and Sophie Turner have lent their considerable star power to music videos in the past month. Turner stars alongside her husband-to-be in the over-the-top music video for the Jonas Brothers comeback single Sucker, which had more than 52 million views in under a week after its launch. It is her second star-turn as a video star, having played the lead role in the video short for Oblivion by Bastille in 2014. Williams, who has two music video credits with The Vamps and Seafret, delivers a tear-jerking appearance in the clip for You Mean The World To Me, the new single from rising British artist Freya Ridings. The short music film, which depicts a father and daughter's relationship over the years, reunited her with former cast member Lena Headey, who directed the clip. "I had such an emotional response to Freya's voice and the song," Headey said. "I think we achieved a version that allows us to see Freya in a raw emotional performance. And the family element is what the song is all about." Ridings is being hailed as the next big artist to emerge in the UK and while the new single is striking all the right chords with tastemakers around the world, the Game of Thrones cameo can't hurt attract more attention to her work. "When I heard that Lena Headey and Maisie Williams wanted to work on the music video for the new single I was beyond humbled," she said. "This is a hugely personal and emotional song for me. I'm just in awe of the emotionally intelligent, strong women that worked on it, which also reflects the woman it was originally written about - my mum." Irish anthemic rock artist Hozier tapped Natalie Dormer to star in the video for his 2015 single Someone New, which was directed by her then fiance Anthony Byrne. In the video which has had more than 72 million views, Dormer pretty much acts out the song's sentiment by killing a lot of someone news. Many Sia fans were understandably shook when her dance muse Maddie Ziegler didn't show up in the video for Fire and Gasoline in 2015. But it wasn't exactly a music video. It was a promotional short for Heidi Klum's lingerie line which starred the model alongside acclaimed Chilean American actor Pedro Pascal, who played Oberyn Martell in several episodes of the 2014 season. With the plethora of musicians declaring their love for the television drama series, it was inevitable there would be a decent line-up of pop and rock stars plucked for cameos. 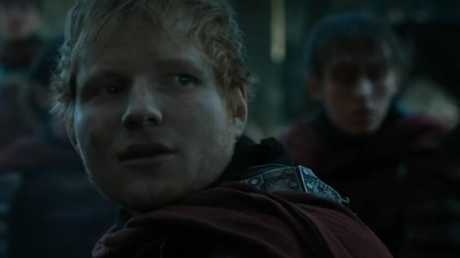 Ed Sheeran copped more than his fair share of social media derision for his polarising turn as a nameless Lannister soldier in the opening episode of season seven as a gift for mega-fan Maisie Williams. Eagle-eyed Coldplay fans spotted Will Champion playing a drummer in a wedding band during season three. Other pop star guests have included Dr Feelgood guitarist Wilko Johnson who had a long running role in the first two series as the royal executioner, three Mastodon members appeared as reanimated corpses and Snow Patrol frontman Gary Lightbody.